While Kevin Feige does try to keep the look and feel of most stories told in the Marvel Cinematic Universe the same, he does allow some directors to add a little bit of their own distinctive tone to the film. Such is the case with Ant-Man’s director, Peyton Reed (Yes Man). For Marvel's second film entry in the Marvel Cinematic Universe for 2015, they decided to go with a character small in size, but large in might, Ant-Man. Paul Rudd (This Is the End) stars as Scott Lang, a man of the people, who was incarcerated for stealing from the rich and giving to the poor. After a stretch in the United States penal system he is released back into the real world, struggling for work and the ability to pay child support to see his daughter. Desperate for funds, Lang falls back on his cat burglaring skills to break into Dr. Hank Pym's (Michael Douglas; Wall Street) house, only to find that his "big score" is an odd looking motorcycle suit and helmet. Eventually, curiosity gets the better of him, and Scott tries on the suit and is catapulted into a world where everything is much larger around him, becoming the Ant-Man. A strong supporting cast helps to enhance Rudd an Douglas' performances, including Evangeline Lilly (The Hobbit: The Battle of the Five Armies ) as Pym's daughter and Michael Pena (30 Minutes or Less) as Lang's friend who provides some great comedic relief to the film. However, Ant-Man's casting is unfortunately brought down by the acting of Corey Stoll (The Strain), whose performance is almost as lifeless as the Chitauri aliens that invaded New York during the Avengers (2012). Try as he might, Stoll's character, Darren Cross, just did not work in the film. The character was not interesting on the screen and, in most scenes Stoll was in, the other characters stole the spotlight. While Kevin Feige does try to keep the look and feel of most stories told in the Marvel Cinematic Universe the same, he does allow some directors to add a little bit of their own distinctive tone to the film. Such is the case with Ant-Man's director, Peyton Reed (Yes Man). Instead of trying to film just a super-hero origin story, Reed adds a bit of an Ocean's Eleven caper feel to the film, including some humorous cut scenes featuring the voice talents of Michael Pena. With most Super-hero films, special effects are key and can make or break a film. With Ant-Man, this is no exception. Thankfully, the crew at Industrial Lights & Magic were up to the task and make the effects look amazing. The shrinking effects and the large scale environments that are presented to the viewer push the envelope further than ever seen before in this type of film. It feels as if you are taking the journey down the rabbit hole with Scott Lang, and discovering a new world that can only be seen by the incredibly small. Ant-Man's Blu-ray video transfer does a nice job of retaining the colors of the original theatrical print in both the 3D and 2D transfer. The is no visible artifacting and the detail displayed on the transfer is amazing. Rounding out the flawless video is the DTS-HD Master Audio 7.1 lossless soundtrack. The dialog is crisp and clear and does not get lost in the special effects, and the effects themselves come through loud and clear and envelope the entire room. To allow for the best compression rate possible, the 3D disc does not contain any special features. They are all to be found on the 2D disc, which includes two featurettes on the making of the film, a not so funny gag reel, some very good deleted and extended scenes, as well as my personal favorite, WHIH NewsFront, which fleshes out the Marvel Cinematic Universe beyond the Ant-Man feature length film. Ant-Man is a very good, by-the-numbers entry for the Marvel Cinematic Universe, and while it is not Marvel's best work, it is still a fun movie to watch with some great comedic elements and special effects. It will be interesting to see how Ant-Man is handled in the upcoming Captain America: Civil War film. Download Ant-Man from the iTunes Store in Digial HD. 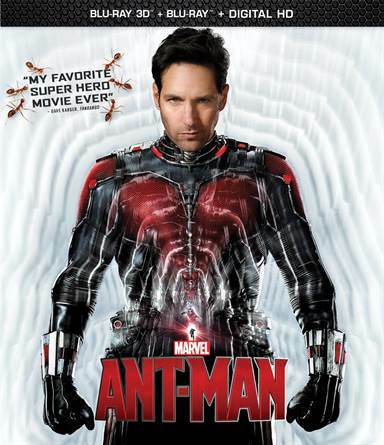 For more information about Ant-Man visit the FlickDirect Movie Database.